This is an all-in-one summary on virus infecting MacBook Pro laptops, with a special emphasis on methods to remove all types of harmful code from them. MacBook Pro is a premium line of Apple’s laptops. Such an honorable status, though, doesn’t make them any better protected against malware than entry level Mac machines. Moreover, it also means “premium” focus of cybercriminals who are constantly scouring the Mac landscape for preys. Technically, these fancy devices are just as susceptible to infections as their less powerful counterparts, primarily because they run the same operating system. Some might argue that macOS virus is the exception rather than the rule, but we can prove this wrong. There have been numerous adware, scareware, and even some ransomware campaigns zeroing on this platform over the past years, and this trend continues to be the case. As far as the quantity goes, adware is by far the dominating threat to MacBook Pro’s. This is a vast niche encompassing browser redirect viruses, also known as hijackers, and ad-injecting culprits. Let’s start with the former, that is, malicious apps taking over web browsers and rerouting traffic to what’s called landing pages – mostly pseudo search engines, junk ecommerce resources or sites hosting drive-by virus downloads. These pests are typically manifested as aggressive plugins or extensions that are furtively embedded in Apple’s native Safari and additionally installed third-party web browsers, such as Mac versions of Chrome or Firefox. You might overlook the trespass, because these baddies mostly sneak in alongside other programs, all under the umbrella of the same installation clients. As a result, your default search engine, new tab and homepage will be replaced with some rogue URL that will be resolved whenever the above mutilated values are supposed to be triggered. The destination page will often include some type of a spoof warning that tries to manipulate you into downloading other nasty infections. Ad-injecting applications are even more irksome. They display tons of advertisements on pretty much every web page you visit from an infected MacBook Pro. Just like hijackers, these PUPs (potentially unwanted programs) make their way into computers by dint of software bundles. Therefore, when installing any freeware that appears too good to be true, consider selecting the custom setup mode that will unveil the actual package of apps configured to get on board in one hit. A few extra clicks on the install stage can save you the trouble of eliminating noxious Mac threats afterwards. When inside a host, the average ad-injector establishes persistence by adding an aggressive browser extension that gets elevated privileges. In particular, it can insert arbitrary elements into the layout of visited sites. In the upshot of this tampering, you will be stumbling into popups, transitional ads, bizarrely hyperlinked text fragments (in-text links), and various other sponsored items, including banners, coupons, price comparisons, and freebies. What’s more, these entities are targeted most of the time, which designates another nontrivial adverse trait of adware – online user activity tracking. The infection keeps record of every keyword you type in a search engine, every website you visit, and quite possibly every password you enter. So the damage from this misdemeanor can, obviously, exceed irritation alone. Some adware samples aren’t as innocuous as they might appear – keep that in mind. Scareware resides further down the MacBook Pro malware hierarchy. These impostor baddies are really straightforward in their tactics. They bombard victims’ conscience with a slew of fake alerts reporting viruses and system performance issues. Their goal is to frighten you into thinking your computer is about to run out of memory space or crash due to severe virus activity. For instance, the rogue utility called Mac Auto Fixer, which surfaced in early August 2018, will list critical disk usage problems as well as system and memory errors even if your MacBook Pro is brand-new and has been booted up for the very first time. The phony scan results will be accompanied by recurrent popup warnings that remind you of the purported tech quandary and insist that you hit the Clean Now button. Now, that’s where the trick is – the “fix” suggested by any scareware boils down to your paying for its license. The whole modus operandi is ridiculously simple: to forge a bad virus contamination scenario and then lend the victim a helping hand. 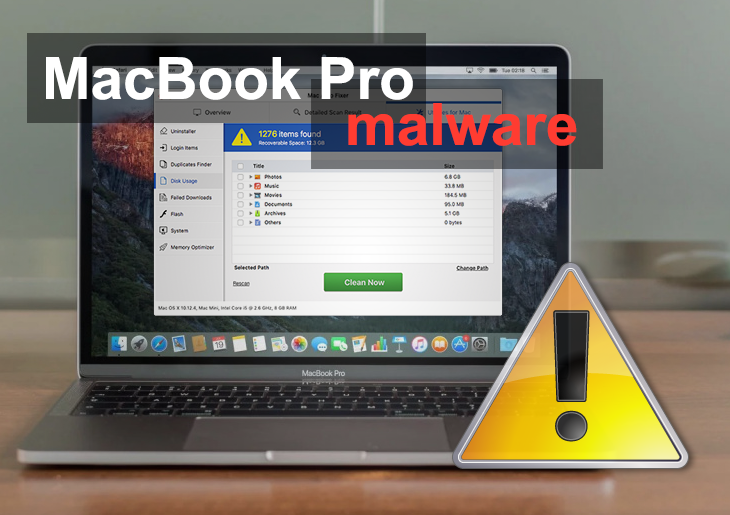 Yet another group of cyber predators haunting MacBook Pro laptops is the infamous blackmail virus. Better known as ransomware, these infections are targeting Macs increasingly but haven’t yet reached a massive propagation milestone, as opposed to the way things are on the Windows arena. The most common type is the police ransomware, which impersonates the FBI or other law enforcement agencies and locks down the Safari browser with a warning page. It attempts to brainwash victims into believing they are being accused of law violations, and if it works the gullible ones may submit the extorted fine. There’s a great deal of misconception about these infections, which are actually browser hijackers rather than conventional ransomware. Plus, they are relatively easy to contain. There have been more devastating outbreaks, though. The KeRanger ransomware from 2016, for example, had a fully functional crypto module that rendered victims’ valuable data inaccessible and held it for ransom. Thankfully, it didn’t get to worldwide propagation, otherwise it could have caused enormous damage to Mac users. Zooming out, virus targeting MacBook Pro is quite versatile, and it’s here to stay. The tips below will help you remove common Mac infections described above and get your laptop running smooth and hassle-free. This method is applicable if the name of the infection is known, for instance in case it’s a rogue optimization tool or fake antivirus that’s causing issues. The steps listed below will walk you through the removal process. Be sure to follow the instructions in the order specified. When confronted with virus on MacBook Pro, you can neutralize its toxic impact by leveraging a specially crafted system utility. The Freshmac application (read review) is a perfect match for this purpose as it delivers essential security features along with must-have modules for Mac optimization. This tool cleans unneeded applications and persistent malware in one click. It also protects your privacy by eliminating tracking cookies, frees up disk space, and manages startup apps to decrease boot time. On top of that, it boasts 24/7 tech support. The following steps will walk you through automatic removal of Mac virus. 2. Once the installation has been completed, Freshmac will automatically start a scan consisting of 5 steps. It scans cache, logs, unused languages, trash, and checks the MacBook Pro for privacy issues. 4. Check whether the malware virus has been removed. If it perseveres, go to the Uninstaller option on Freshmac GUI. Locate an entry that appears suspicious, select it and click Fix Safely button to force-uninstall the unwanted application. 5. Go to Temp and Startup Apps panes on the interface and have all redundant or suspicious items eliminated as well. The malware shouldn’t be causing any further trouble.